Chris & Assunta Corpora owners of Abbracci Bakery and Cafe we’re kind enough to spend an afternoon in the school garden teaching us how to make quality pizza dough, pesto, sauce and grilled pizza. 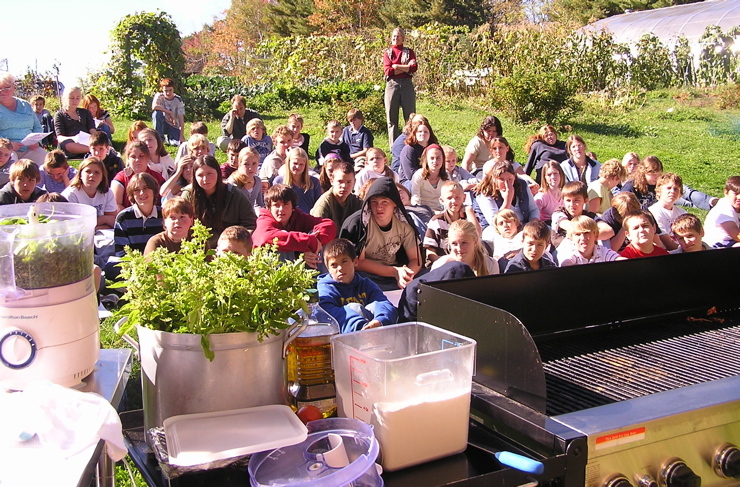 The students prepared tomatoes for sauce, picked lots of herbs, garlic, edible flowers and onions while the grills and prep tables were set up in the garden. 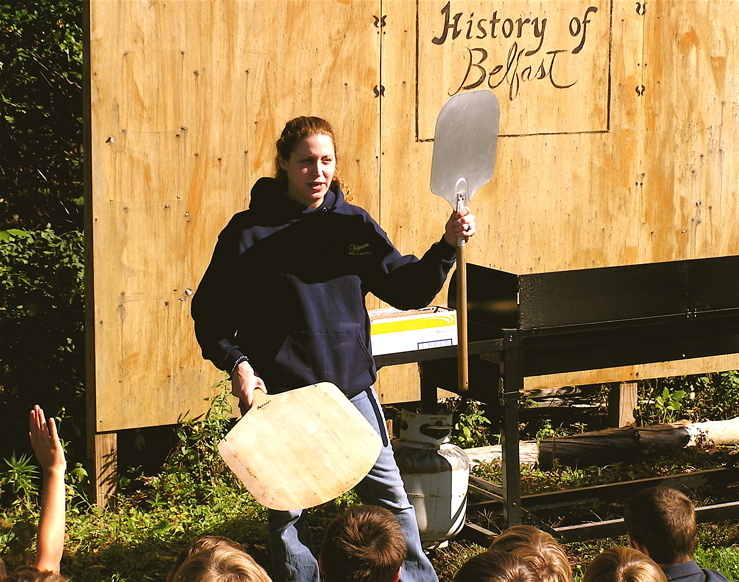 Assunta explained how to use the proper pizza equipment like the board and peel she shows here. It was interesting to hear the history and reasons behind many of the ingredients used in different styles of pizza. So now we know why we use so much basil…to cut the acid of the tomato in our sauce. 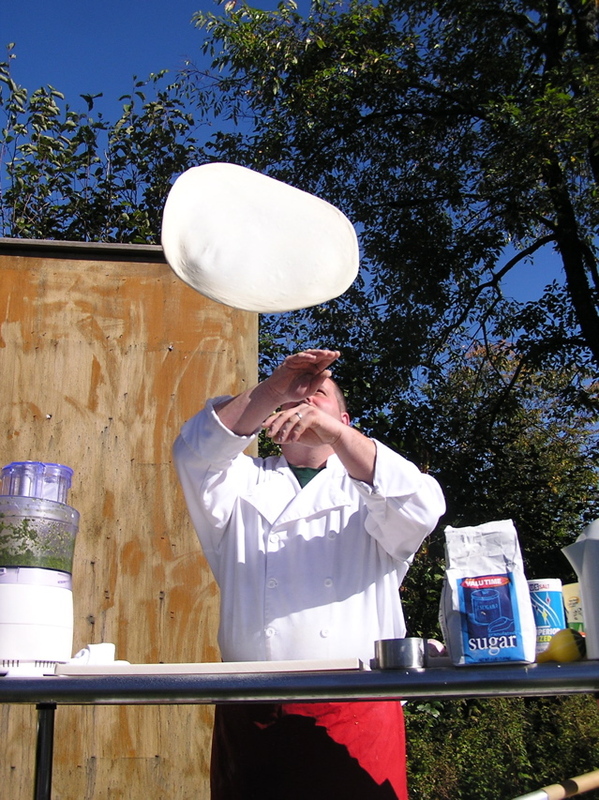 Chris tosses a pie for made with a quick acting yeast. He cooked pies on the grill for 95 students in about 12 minutes whle Assunta and I cut the pies as fast as possible. The trick is to get the grill really hot and stay right with it. Watching everyone make pizza with our garden vegetables was a lot of fun. But what made my day was getting to taste it. So far this is my best school year ever! I think I will love school this year. So far in the garden I have picked tomatoes, made paper, flipped soil, sprayed the garden beds in the green house, and much more. Working in the garden has inspired me a lot. I’ve learned a lot about gardens and life ahead. Working in the garden taught me to do more and get out more and do more things like tryout for basketball which I am doing know. I’ve made more friends doing that. THANK YOU GARDEN PROGRAM!!!!!!!!!!!!!!!!!!!!!!!!!!!!!!! So far in the Garden I have picked cucumbers, covered the beds in the greenhouse with bone meal and “Sopo”, taste tested tomatoes, and cleaned up around the farm stand. Working in the garden has showed me the importance of fruits and vegtebles and has inspired me to go outside more.